It's official. The snow has arrived here in the Great White North and that means a footwear upgrade. I am looking for a number of traits in a pair of winter shoes. The Keen Obsidian WP covers all the bases. They are warm and dry thanks to the KeenDry lining and waterproof seamlessly constructed outer. 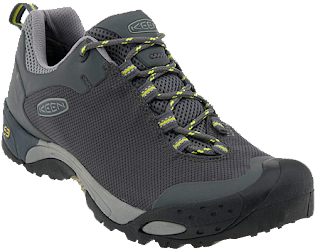 Whether hiking a trail or shoveling the walk, the grippy tri-density footbed keeps you firmly planted. Super easy to keep clean and looking good, these shoes go from the slush and slop to a night out in about 30 seconds. Just wipe the off with a damp rag and they're good as new. The asymetrical lacing system is more than just a design element. The angle seems to provide a more adjustable fit and eliminates the pinch across the top of your foot found in most traditional lace designs. The heel and toe are protected from gnarly trails by stone bruising plates. These light waterproof hikers are yet another great addition to the Keen line-up.